It is finally here and I am so excited to be able to show off what I made with all the wonderful ingredients sent to me by my partner Maria Rosa Sharrow of Willow Street Gifts. According to the rules of this hop, we sent each other a focal, some supporting beads and a clasp that isn't a lobster claw. Maria was more then generous and actually sent me three soups and a focal. I do want to apologize up front for the pics. 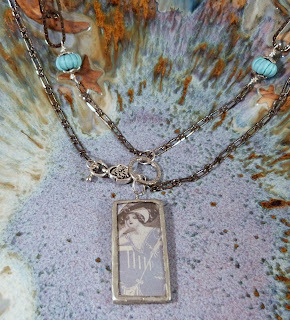 I have tried every which way to get some good ones and have come to the conclusion that I have to find a mannequin since I tend to go for longer necklaces. Guess that it is time to start haunting thrift stores. I also want to thank Lori Anderson for putting together such a wonderful hop. I have no idea just how she managed to keep track of 400 of us and to do it with such grace. She has a book coming out in October based on these hops so aptly named Bead Soup. Be sure to check it out! 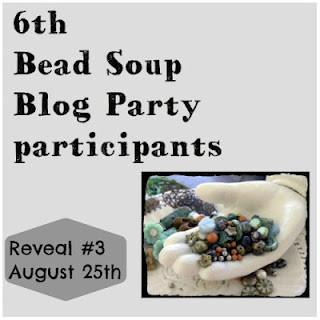 The Bead Soup Blog Party is all about challenge and this one presented a couple. First of all, I have never worked with this style of focal. They demand that they take center stage in an understated type of way. And that led to my second challenge which was to keep things simple. And you know I don't really understand why that is such a challenge as that is the style that I tend to wear. I also challenged myself to use all the ingredients and I did with the exception of the bonus focal. I am waiting for it to whisper to me. This was my first soup. Isn't that focal just gorgeous! She really reminds me of a sailor's wife waiting for him to come home. 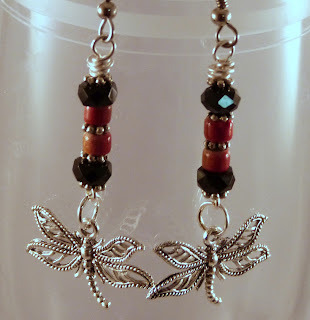 I decided to ease my way into cooking and made this pair of earrings. In a way I guess that isn't really easing as I don't tend to make earrings even though I love to wear them. In these I used the silver heart beads and the faceted coins. I added a pair of sterling silver ear strands to the mix. I am happy with how they turned out. Next up is an anklet that has already been put to good use this summer. 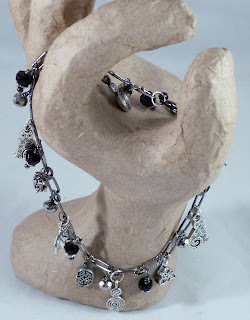 In this serving I used the black crystals that Maria Rosa sent to me and I added gunmetal chain and pewter charms. 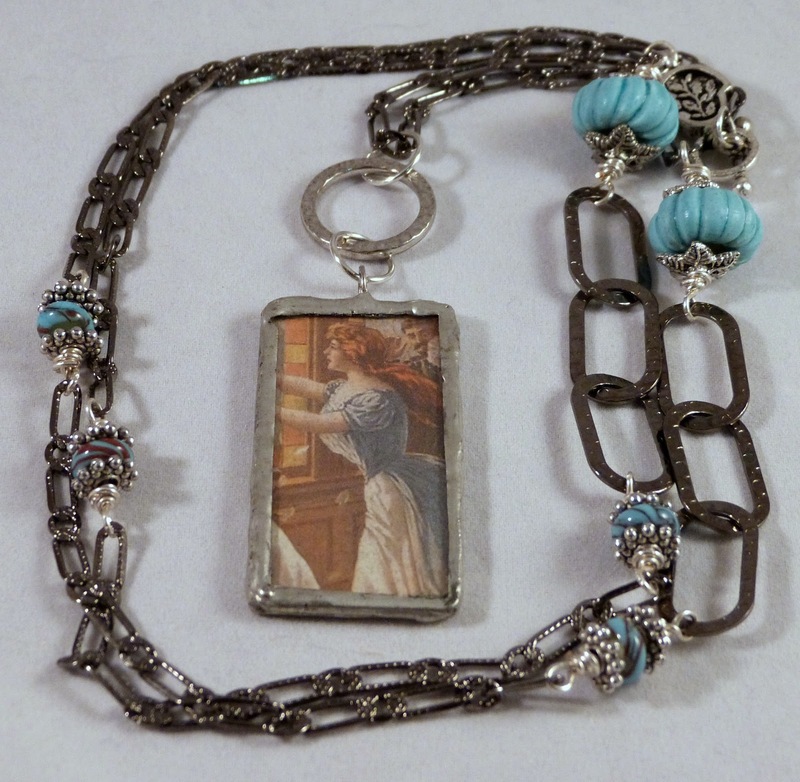 This necklace is the one where I really could have used a mannequin as it is 30" long. In this necklace I used that lovely focal and clasp, and added in some gunmetal chain in a couple sizes, some blue beads from Earthenwood Studios with bead caps and some painted wooden beads. Check out the redhead from the other side of the focal! Now onto the second bead soup sent by my generous partner. I love this focal though it isn't one I would have picked out for myself. That is the fun of this hop. 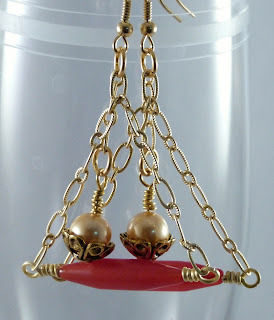 I started out with a pair of earrings using the vintage red and gold lucite. I just added a bit of chain and the findings. 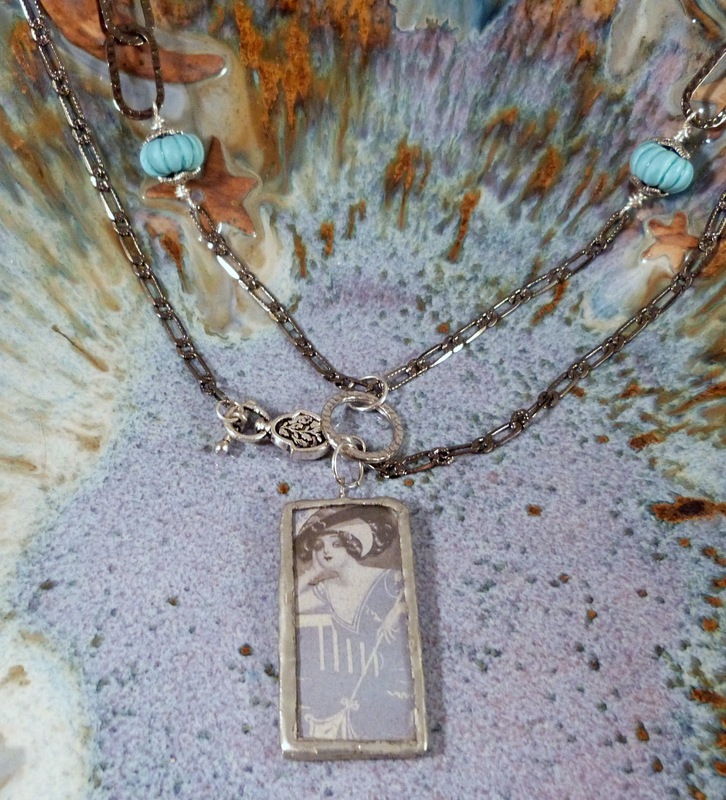 For the necklace, I used the focal, the clasp, and some more of the vintage lucite. I added in the chain and the gold Swarovski pearls. 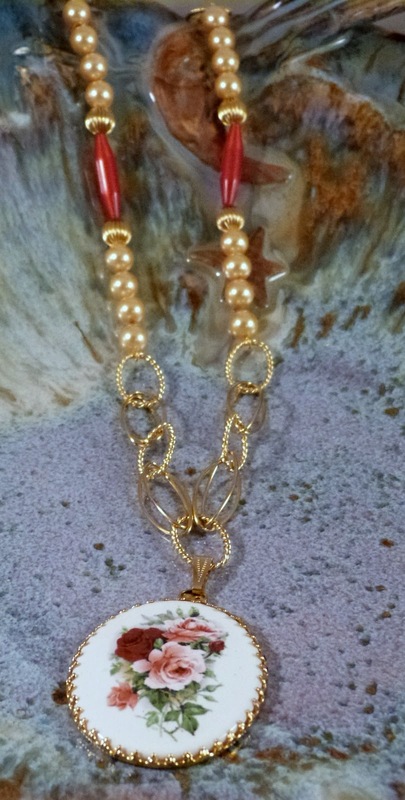 This is again a longer necklace at 28". And now for the third helping. I fell in love with this focal. It is so unique and orange has really been calling my name lately. I started out this soup also with a pair of earrings. Another challenge that I made to myself and I am happy that I followed through on. 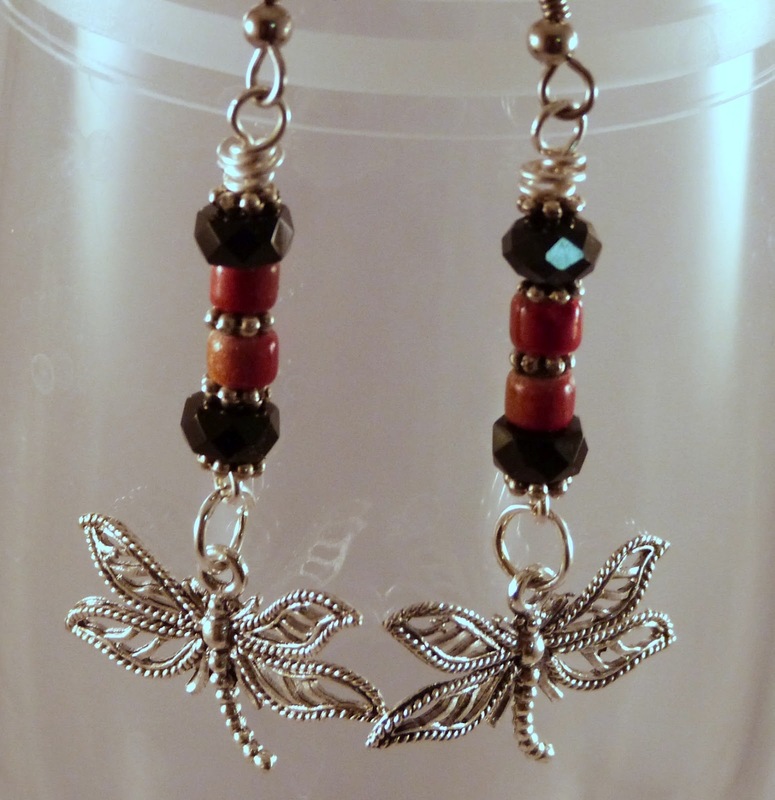 In this pair I used some of the wooden orange beads and the black crystal. I contributed the findings and the charm. In the necklace I used the gorgeous focal and the clasp. I added some chain and some lampwork beads from StudioJuls. I have been wearing it lately and I have had one person offer to buy it right off my neck. However this one is mine and besides I had to try to get some better pics then I had. My last piece is a combination of all the soups as I wanted to use up the rest of the beads. This is the first time I have tried crocheting with beads and I am not all together happy with this bracelet so I will probably be remaking it. Okay still with me? I promised a giveaway with this party and so there shall be. 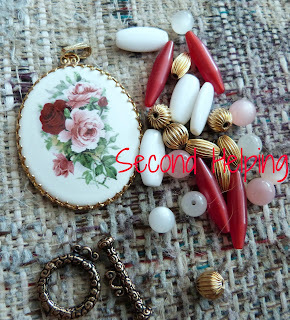 I will be giving away both the first and second pair of earrings to one lucky commenter. I will be keeping the giveaway open until September 2nd to give everyone a chance to look at all the gorgeous jewelry that everyone has made. Now be sure to check out everyone's blogs. There will be lots of eye candy there and possibly more contests. Hi Shai. I hope you had fun working with all of the different things I sent to you. I can't believe You made so many things!! I really like what you did with the butterfly pendant. I make so many necklaces and yet I don't even wear necklaces. I am an earring and bracelet type of gal. It's funny but I would never have come up with the pieces you did. You used everything to it's fullest. It was a pleasure being your partner and hope to read your blog as often as time allows me too. Congratulations on using almost all this wonderful Soup(s)! These are exquisite pieces, Shai, and it is no wonder you have people trying to steal them from you! I think you were very brave to try a brand-new technique for this, knowing you would be showing the world LOL That is the spirit of creating!. Butterfly necklace and earrings. That soldered focal of the wing is amazing! You did a Great job with your soups. Your soup is good. I don't know which piece I like the best. And your photography is great! Holy smokes! what a busy girl you've been! I do really love that last focal - just a gorgeous piece! What a wonderful assortment of pieces. I really love seeing all of them together, it gives a real sense of your style and eye. A stunning and unique pieces!Congrats! oh, wow! a giveaway!!!! I love the blue earrings. I think your crocheting looks great. I've also been trying my hand at crocheting jewelry pieces. Have you tried crocheting with wire? That is a really neat look! I love how all of your pieces came out! You have done a fabulous job! Earrings are hard for me; i guess because I hardly ever wear them! I hadn't thought about it until now, but I didn't even make any earrings for this BSBP go-round! Wonderful use of your soup! Looks like you had a lot of fun cooking your soup! Hey, Tacoma~ I'm just down I5 in Oregon City and have a daughter that lives in your fair city! That said, you made a lot of pretties with your soup! I've done some crocheting with beading, too. The bracelet in my soup was crocheted with silk sari ribbon and I've even tried crocheting wire, but like the thicker fibers, better. Nice job with your beautiful bead soup! Beautiful focal pieces and your designs are beautiful! Maria Rosa was my partner for the previous party, I see she once again sent an amazing collection of goodies! Don't you just love her handmade pendants...beautiful! You did a great job with your soup ingredients, I love the earrings the best! Cheers! Beautiful pieces...the crochet looks pretty to me!! what a grea floral focal - you done the best job with it! congratulations! Oh VERY clever with all your soups! You did a remarkable job and they're beautiful. Thank you so much for participating! 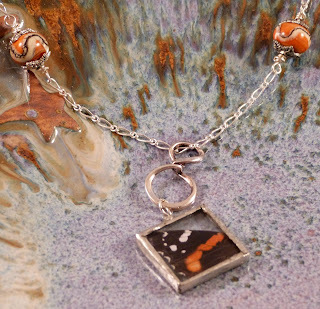 I love the handmade pendants by Maria! All of your creations are wonderful! I always say I'm going to use them all, but it never seems to happen! Simplicity is what I love most. You captured that in all your pieces! Great soup! So many beautiful creations! Great job! necklace with the matching earrings WOW!!! Three helpings of soup! Woohoo! And what lovely soup it is. So many beautiful creations you made! Love these pieces. Lovely job. You really rocked these soups big time. There was so much to work with and I can tell you thought out each and every piece. 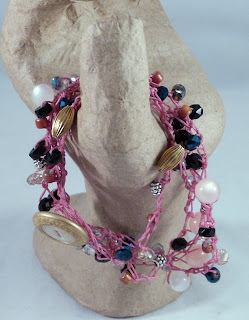 It's a shame you're not happy with the crochet bracelet, I think the colors and basic design work really well together. Hopefully you'll get it worked out in no time! Awesome designs!! You really spotlighted each focal perfectly. It is so nice of you to giveaway your beautiful earrings. Thanx for the chance to win those blue beauties. Everything is just beautiful. It all ties together quite well even though each piece is unique. So romantic looking. Great job! What an amazing serving of soup!! You can tell that you really worked with each of the focals and used them in unique, but workable ways. 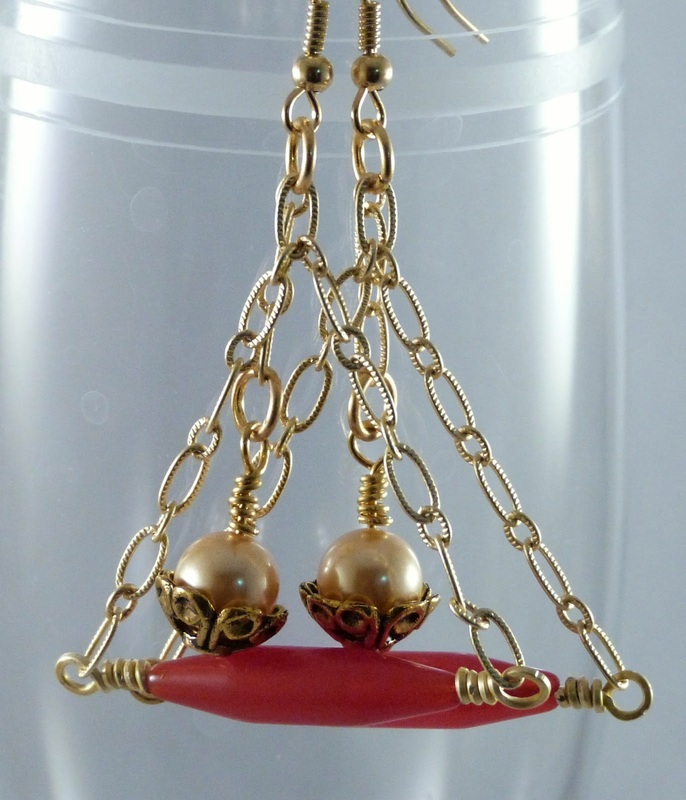 Most people would take those pendants and string them on chain or fabric and be done, but you created pieces that both accented the focals and had true, beautiful design elements. Great job! And honestly, that flower focal would have completely stumped me, but I love what you made so much that I even want to wear it and I don't do gold or that style of floral much at all. Outstanding job! The focals you had to work with were gorgeous and you featured them beautifully! What great pieces. I really like your last bracelet, where you used pieces from everything. Very nice. Wow, that's a lot of soup. You were very ambitious taking on 3 partners. I'm a blue girl though, so that first pair of earrings really caught and kept my attention. Great job. wow... i wide selection from your soup! all your lovely pieces are so well created, congrats! WOW! Great job on your designs! They are all so creative and different! 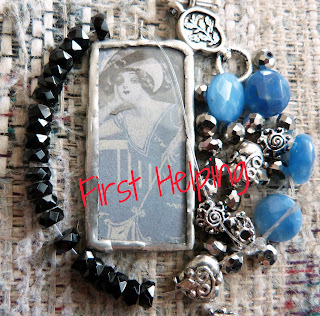 I would love to win a pair of your earrings! Thank you for the giveaway! Wow! You were very busy in your soup kitchen! Lovely pieces! And I think you did splendidly with your first crochet attempt! 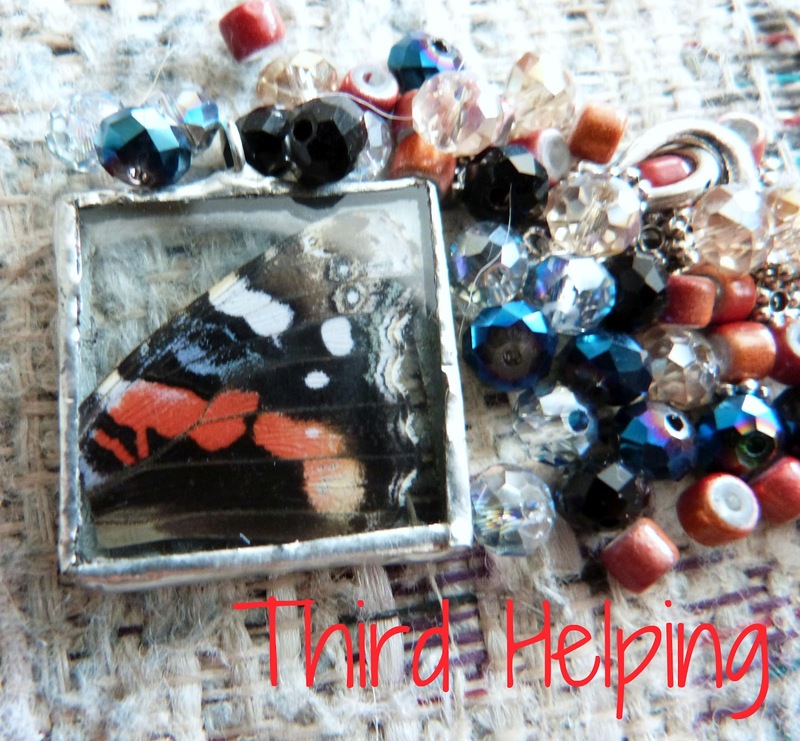 Thanks for stopping by my blog and sharing your kind words! What a fun experience this has been! Can't wait for Lori's next party! Love what you have made, you did Good!! in your search for a mannequin don't over look decoupaging it with something else to get the look you want. I did that with a cloth one, covered it with paper, and I Love it!! You need to continue making earrings, you are definitely a natural!! 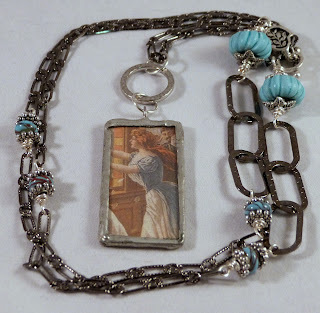 I am so in love with the "Sailors Wife" necklace, the focal is incredible, the lampwork is too cool and the chain is amazing...where do you get your chains (if you don't mind sharing). Fantastic creations. I love the butterfly necklace, just stunning. Beautiful pieces made from your amazing soups! !